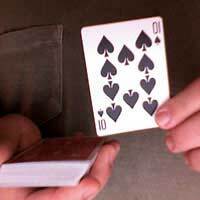 A classic card trick using two decks of ordinary playing cards. The magic takes place in the spectator's hands and leaves a smile on their face. The magician produces two decks of playing cards with different coloured backs. Telling his audience to “Do as I Do” he shuffles the cards and switches decks. Both magician and audience member pick their favourite card and then cut the deck multiple times. Once more switching the deck both find the favourite cards and in a magical moment, flip them over to show they are the exact same card. Using a classic “peep” technique, the magician is in total control the entire time. Two decks of playing cards; preferably with different back colours or designs to keep them easy to tell apart. Shuffle the cards, explaining as you do that you want to make sure the decks are nice and random. “Now I’ve shuffled your cards, and you’ve shuffled mine.” As you square up the cards, take a peek at the bottom of your deck. This will be your marker card. Pass their deck across the table to them, and take yours. Have them spread the cards out facing them as you do the same. Ask them to pick their “favourite card” as you do and remove it from the deck, placing it face down on the table. Your card is indifferent- all you need to do is remember your marker card. Make a complete cut- take off half the cards and place them down on the table, then pick up the remaining cards and put them on top. Your partner will do the same- now your marker card is on top of their favourite card. No matter how many times you now cut the deck- as long as they are complete cuts- those two cards will stay together. Fan your partner’s deck as before and say, “now we find our favourite cards in each other’s deck.” You will find your partner’s card directly to the right of your marker card. Remove this card and place it face down on the table. After the spectator has done the same, place the deck down on the table and square it up. Pick up the favourite card and say, “now, wouldn’t it be amazing if we both had the same favourite- lets turn it over on three…one, two, three!” Turn over the card to reveal that they are, indeed, the same! As you don’t care which card you pick as your favourite, play act a little. Wait until they have picked their card and then pull out a random card. When it comes time at the end to pull “your favourite” out of their deck, however, go right to it and pull it out- act as if you know exactly what card you are going for.